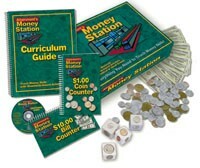 Program Contents: 126 page curriculum Guide, booklets for coin and bill counting, realistic imitation money, four durable coin cubes used in adding and equivalent activities. Win/Mac CD-ROM with PDFs to print out worksheets and assessment forms. CURRENCY IN US DOLLARS ONLY. Teach money concepts! 46 illustrated worksheets correspond to skill objectives, like "counting dimes to 30 cents" or "counting change back from a $10 purchase." Worksheets reflect real-world experiences, making them relevant for learners of any age. One Dollar Coin Counter and Ten Dollar Bill Counter are flip books that begin with basic match-to-sample problems and progress to more complex activities. Count realistic imitation money to get answers to worksheets. Activities follow skill sets that correspond to math standards from the National Council of Teachers of Mathematics for grades K-3. • All new money and materials for 4 learners!